^ Nwaocha Ogechukwu Friday (30 May 2012). 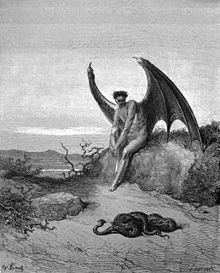 The Devil: What Does He Look Like?. American Book Publishing. p. 35. ISBN 978-1-58982662-5. Retrieved 22 December 2012. ^ Breslauer, S. Daniel, ed. (1997). The seductiveness of Jewish myth : challenge or response?. Albany: State University of New York Press. p. 280. ISBN 0-79143602-0. ^ "Lucifer, the Son of the Morning! Is it he who bears the Light, and with its splendors intolerable blinds feeble, sensual, or selfish Souls? Doubt it not!" (Albert Pike, Morals and Dogma, p. 321). Much has been made of this quote (Masonic information: Lucifer).